Home › Products › Wedding Gowns Blog › Button-up or Lace-up back? 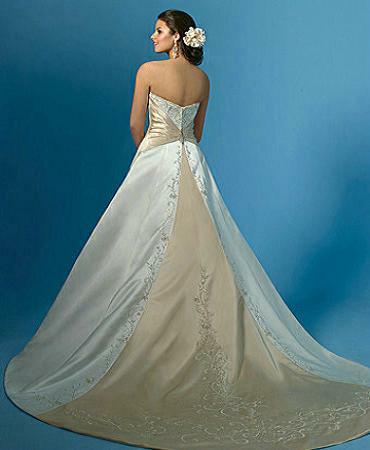 One of the frequently asked questions from brides-to-be is, “Which is the best back closure for my wedding gown?”. There isn’t one answer to this question as there are choices to be made and each decision may be based on the look you want or the flexibility you need. A button-up back often is combined with a zipper, with the buttons covering the zip when the dress is worn. I think that a button-up back closure with lovely satin-covered buttons gives a stylish and glamorous look to a bridal gown,such as the Embroidered Sweetheart Neckline Wedding Dress on the right. This look is traditional and stylish, and this may be best if you are having your gown custom made to your exact measurements at a bridal store. Another option for your bridal gown is a lace-up back closure which gives flexibility if your gown is being purchased through an online bridal wear store, or if you think you may gain or lose weight before your wedding. The gown shown on the left is a beautiful A-Line Sweetheart Neckline Chiffon Wedding Dress with a lace-up back. If you are wearing a gown with colour, then the ribbons can often be made in the contrasting colour, as shown in the White with Red Satin Strapless A-Line Wedding Gown above, which lends a modern, unique look to your gown, as in the Strapless Satin Wedding Dress below. The ends of the ribbons can be either tucked inside beneath the last loops or tied in a bow and left outside the dress, as in these two lovely gowns shown here. When ordering online, you can often change the back of the gown you are ordering, by requesting the closure of your choice and this change can often be made free of charge or for a small additional fee. The lace-up back is elegant and beautiful and once the ribbons are threaded and tied at the bottom, the effect can be charming. Here is a video which shows how to correctly lace a wedding dress, so that you know exactly how this should be done for your special day. For either a button-up back or a lace-up back, a bride will need help to finish dressing on her wedding day, and both these closures cannot be done alone! This is where a patient and wonderful maid-of-honor or mother-of-the-bride comes in, and you need to allow lots of time for your gown to be laced or buttoned.